WASHINGTON — A federal appeals court said Monday it won’t reconsider its ruling to uphold the government’s “net neutrality” rules that require internet providers to treat all online traffic equally. The rules prohibit internet service providers from favoring their own services, blocking other sites and apps, or creating “fast lanes” for video and other data services that pay for the privilege. That means companies like Verizon — which offers its own video services — can’t slow down Netflix or charge Spotify extra to stream faster than competing services. New FCC Chairman Ajit Pai said in a speech last week that the rules were unnecessary. He wants to eliminate the FCC’s broad powers to monitor Verizon and others for bad behavior. 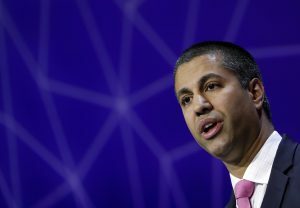 In a statement Monday, Pai said the court’s decision was “not surprising.” He said the process of repealing the rules is expected to begin at the FCC on May 18. Judge Sri Srinivasan, who helped write the original opinion in favor of net neutrality, said reconsidering the case would be “particularly unwarranted at this point in light of the uncertainty surrounding the fate of the FCC’s order.” He noted that the agency would soon consider replacing the policy with a different one. Left: FCC Chair Ajit Pai, seen here delivering a Feburary speech at Mobile World Congress in Barcelona, Spain, thinks net neutrality rules are uneccessary. But a federal appeals court said Monday it won't reconsider its ruling to uphold the government's "net neutrality" rules that require internet providers to treat all online traffic equally. Photo by REUTERS/Eric Gaillard.